BugDoc Dave here. Welcome to my monthly Stretch Tuesday article for August! At least, this time I got the first Tuesday on time! Cal did double duty last month because there were five Tuesdays in July, and he covered much of what went on at our convention in Marietta from July 25 through the 27th. Our club has the tradition of assembling a club display that concentrates on a color (we did green last year), a maker, or specific items. This year, I was in charge of assembling all the handled servers in stretch that we could find. Earlier, I had said that we would have over 50 servers and we ended up with 120 different servers!! It was quite an assemblage. Since I’ve covered handled servers before in the Stretch Tuesday, I wanted to merely show you some of the items that I’ve not shown before. 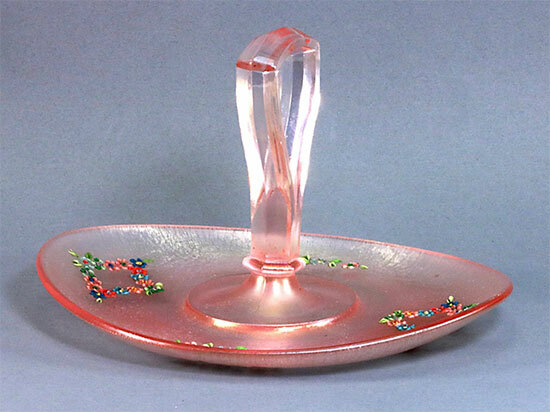 First, most of the companies made sandwich trays which have fairly straight sides to the bowl part of the tray. When this has a rolled-up rim, the trays become fruit trays. Below are examples of the Imperial #725 sandwich tray and the same item as a fruit tray. Both have a distinctive Imperial decal of a floral motif. Of real interest to me are the unusual cupped in trays that Fenton made. These are really tough to find and three of them were brought by our members! We had one in Persian Pearl (crystal or white stretch), Topaz (Vaseline) and Celeste Blue. 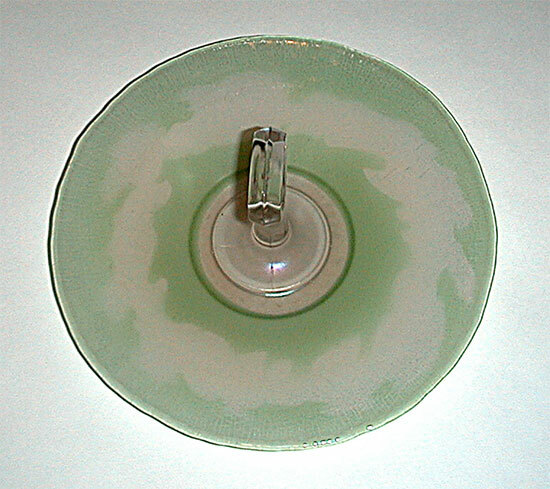 We also had an example of the very rare U.S. Glass “Cumula” pattern which is a white cloud-shaped enamel with a green background (don’t ask me why the background isn’t blue! ?, as nobody knows!!). We had eight different cuttings on the Imperial servers and I’m not going to show all of them except for one that I’ve not shown before. Unfortunately, this cutting of what appears to be a rose bud is on an Iris Ice (Imperial’s crystal/white stretch name) server which makes the pattern very difficult to capture in a picture. 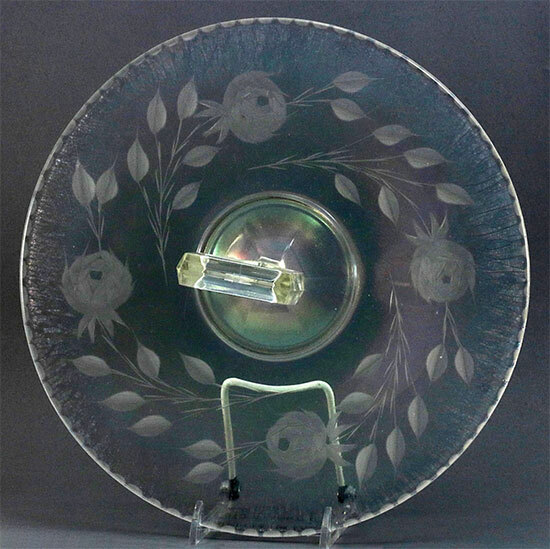 This server also has a set of cut ovals around the rim which is not found on the other cut servers. 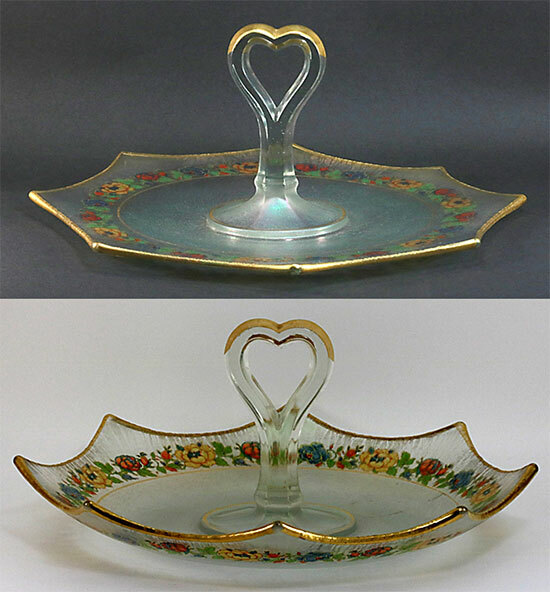 Since the theme was handled servers, we also had examples of Fenton’s butterball trays (#318). 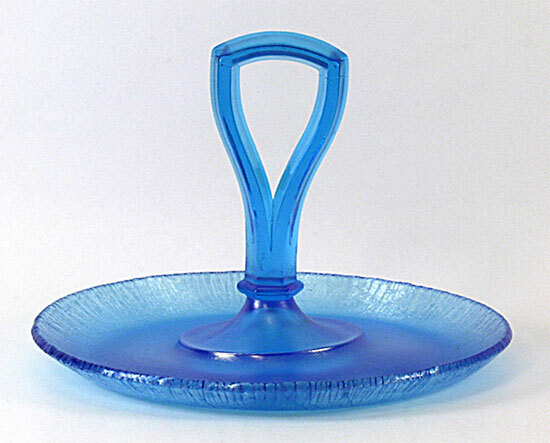 These come with a shovel-shaped loop handle (this one is in Celeste Blue) and the tray is about 6.5-inches in diameter. These butterballs also come with an oval tray which is pretty tough to obtain. This example is in Velva Rose and it has a factory enamel decoration of raised flowers. 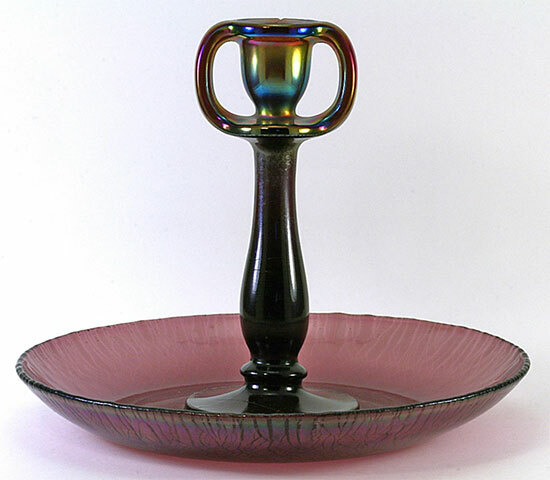 The unusual Imperial “candle tray” was also present in Iris Ice (crystal/white), Blue Ice (smoke) and Amethyst Ice (purple). We have several options for future club displays and I assure you that they will be real eye-poppers! 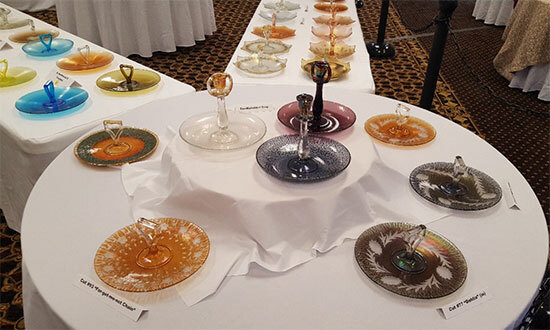 Here is an image of just part of our club display that was arranged on a triangle of tables.